5. Darwinists Portray the Theory of Evolution as "Undeniable"
A scientific theory is generally formulated and then scientifically confirmed or refuted. It is scientifically agreed to or else rejected. The Big Bang theory is a scientific one, and has been confirmed. The invalidity of ideas put forward in the face of the evidence corroborating the theory is evident. Nobody admits the possibility of any diametrically opposed ideas being corroborated because there is concrete scientific proof. And concrete evidence has confirmed this scientific theory against the other possibilities. The theory of evolution has also been proposed as a scientific thesis, and countless pieces of evidence have proved that it is utter nonsense. Not a single piece of evidence exists to support it. All scientific findings prove again and again, with every passing day, that the theory was proposed as a hypothesis and possesses no validity whatsoever. Under normal circumstances this theory should long since have been discredited and consigned to the waste bin. But for some reason that has not happened. On the contrary, the theory of evolution is now espoused, as if were a genuinely scientific one, with false evidence in text books, on TV channels and in publishing organs. The Council of Europe has determinedly sought to defend the theory, and reacted with horror to the release of evidence proving that the theory was not scientific at all. Courts in various countries have strongly rejected proposals in opposition to the theory of evolution and its place in school curricula. Recently, a U.S. federal judge went so far as to state that criticism of Darwinism was a violation of the Constitution.142 The idea of the inclusion in the curriculum of the "difficulties of evolution" that Darwin himself referred to has appalled Darwinist circles. In short, Darwinism is a supposedly scientific theory protected by all states and generally propped up with official state backing. These circles make enormous efforts to prevent the fact of Creation being taught in schools, as this would expose the nonsensical nature of evolution. 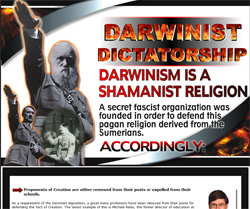 According to the laws of this superstitious religion, Darwinism is "undeniable." In the same way, Darwinism is under the protection of a fascist Darwinist dictatorship right across the world. Rejection of Darwinism is forestalled, because otherwise the adherents of the false religion that is Darwinism would have no means of keeping the theory propped up. Lies are told in loud voices, but to claim that these are lies is regarded as an offense. A theory which began as ostensibly scientific has been turned into a superstitious, dogmatic system of belief far removed from science that cannot be questioned or denied. The really noteworthy point here is that this was done in plain sight, and with no compunctions. This has reached such a scale that even the Pope has had to stage conferences supporting Darwinism in his own home, The Vatican. Churches have had to apologize to Darwin. University professors have lost their jobs, and been excluded from their professions, because of publications questioning evolution. This imposition has been hugely successful in many countries, and evolution has become unquestionable, especially at senior levels. Darwinists may resort to all means to ensure that Darwinism remains undeniable. They cover up evidence that refutes the theory of evolution, distort proofs of its invalidity, and deceive people into thinking that there is actually evidence for evolution, in the same way that Charles Doolittle Walcott kept the Cambrian fossils hidden away for 70 years. Darwinists preconceptions and conditioning obliges them to defend the most illogical things and to express those sophistries from time to time. In the passage above an evolutionary biologist openly states that he will never doubt the veracity of evolution, even if it lacks any scientific and logical evidence. This once again goes to show that the theory of evolution is not espoused because of scientific data and findings. That being the case, there is an evident truth here that has to be accepted; evolution is a perverse, false and deceptive faith. It is Almighty Allah Who creates the earth, the sky and all that lies between. 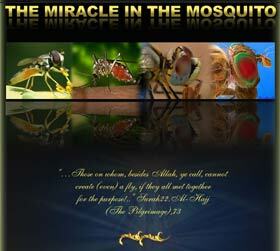 Allah's creation is magnificent and matchless. The impossibility of denying Darwinism, under the pressure of the Darwinist dictatorship, has given some people the impression that it is an accurate and scientifically accepted theory, because the great majority of people mistakenly think that television and the press could never support a deception. They imagine that if it were a deception, someone would have by now exposed the fact. Yet every voice that is raised is silenced in one of various ways. The dictatorial tradition that persisted with pressure and imposition during the 20th Century is still continuing today. 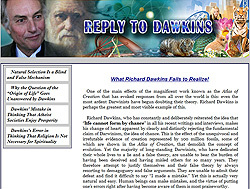 Many scientists are still unable to stand up against the theory of evolution out of fear of losing their jobs, and families are subjected to pressure and threats in the event they and their children oppose the teaching of evolution But no matter how much the theory of evolution is taught in schools, no matter how much scientists who speak out against evolution are silenced, no Darwinist pressure will be unable to stop the enlightenment taking place in the minds of those seeing that evolution is a lie. 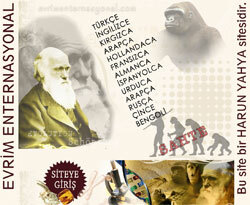 The Council of Europe has today made the teaching of evolution compulsory in schools. 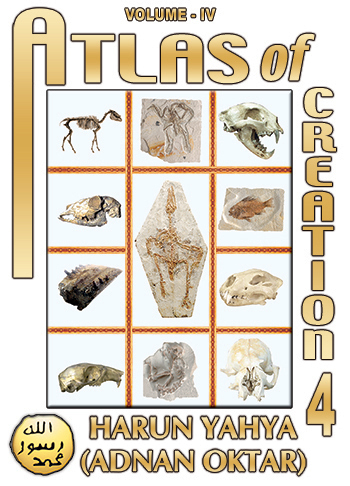 Non-evolutionary interpretations are banned from the curriculum in many states of the USA. The theory of evolution has become an inseparable part of the curriculum in China, Russia, almost all Asian countries, and even in some Muslim ones. It needs to be made clear that what is being described and criticized here is the oppressive and prohibitory Darwinist mindset. Students could be told about evolution in schools as part of their history classes, but the scientific and rational thing to do is also for them to be taught the hundreds of pieces of evidence that prove the theory of evolution is false. Young people must not be forced to undergo an oppressive and biased education. The scientific facts should be set out before them in an impartial manner, and they must enjoy the right to see and learn the truth through their own intelligence and conscience. One undeniable fact about Darwinism is that Darwinists always seek to silence every opponent of evolution that might have an influence on people. The superstitious religion that is Darwinism, which has settled across the world, and its adherents implement such an oppressive policy that even suggesting doubts about evolution leads to that person experiencing very grave difficulties. According to this fascist imposition, harboring doubts about evolution is a crime. Expressing them is a crime. Even suggesting that evolution is an unproven theory, or that it is only a theory, is also a crime. It is impossible for a scientist opposed to Darwinism to teach in the biology department of any university. It is impossible to find a picture of a fossil refuting evolution in any pro-Darwinist newspaper. It is a huge mistake for a high school biology teacher to express any doubts about the theory, even in error. In all likelihood, that teacher's employment will soon come to an end. In the same way, Professor Robert Marks' research site at Baylor University was closed because he questioned Darwinism and the funding given to him for his research demanded back. The documentary concerned considers the experiences of a great many anti-Darwinist scientists, whether they were willing to divulge their names or not, and these people described in their own words how their academic careers were totally ended because of their rejection of Darwinism. Once you're thick in Science, you can question the paradigm. But if you want to get grants, if you want to be elected to high positions, if you want to get awards as a promoter of public education of Science, you can't question the paradigm. These repressive methods employed by Darwinist have a high deterrent effect on some people. Faced with a $1 million fine, a school will be hugely intimidated. A teacher who refuses to back down risks losing his or her job. As William A. Dembski says, this system resembles a dictatorial regime. Nobody can even open his mouth to breathe a word against it. Following moves aimed at putting an end to the teaching of evolutionary biology in the state of Kansas, where there has been a huge campaign for Creation to be taught in schools, the education system in the state came in for widespread intimidation and pressure. In a piece sent to Science magazine, Herbert Lin, president of the National Research Council, announced that American colleges and universities should not regard the biology classes taught in Kansas schools as academic. The following month, Scientific American magazine editor John Rennie asked university admission committees to tell the Kansas schools administration that they would "examine the qualifications of students applying to them from the state of Kansas with the greatest care " and asked them to issue "an open letter to families in Kansas declaring that this bad decision would have severe consequences for their children's futures. "159 The meaning of the threat was clear. It is a crime to oppose the theory of evolution, and those committing such an offense must be annihilated at once. In one recent case, a researcher from the Woods Hole Oceanographic Institute by the name of Nathaniel Abraham announced that he had lost his job for denying the theory of evolution. A letter written to Abraham in 2004 by a Woods Hole scientist said he had been removed from his post because Abraham said he did not accept the "evolutionary aspects" of the National Institutes of Health grant, even though the project clearly required scientists to use the principles of evolution in their analyses and writing.160 In other words, a scientist was officially excommunicated for denying the theory of evolution. The fact that the subject achieved prominence as the result of a suit brought by Nathaniel Abraham in 2007 definitely stems from people finding the courage to stand up to the Darwinist dictatorship. Phillip Johnson relates the story that in 1981, the British Museum of Natural History celebrated its centennial with an exhibition on Darwin's theory of evolution. A sign at the entrance read: "Have you ever wondered why there are so many different kinds of living things? One idea is that all the living things we see today have evolved from a distant ancestor by a process of gradual change. How could evolution have occurred? How could one species change into another? The exhibition in this hall looks at one possible explanation – the explanation of Charles Darwin." An adjacent sign read: "Another view is that God created all living things perfect and unchanging." An accompanying brochure admitted, "the concept of evolution by natural selection is not, strictly speaking, scientific."" That is the technique of the Darwinist dictatorship. Words written against the theory of evolution are heralded as "aggression," and the appropriate measures are immediately taken under the influence of Darwinist scientist and globally respected journals. Under pressure from the Darwinist dictatorship all anti-Darwinist statements are hurriedly silenced. 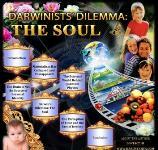 Darwinists have actually begun to realize that the measures they have taken are all in vain. The conditioning they used to maintain with oppressive methods and false evidence will have no effect on the more aware people around today. Science is Darwinists' most important disguise. Darwinism first emerged under the guise of "science." Darwinists also appeared saying, "We are scientists." 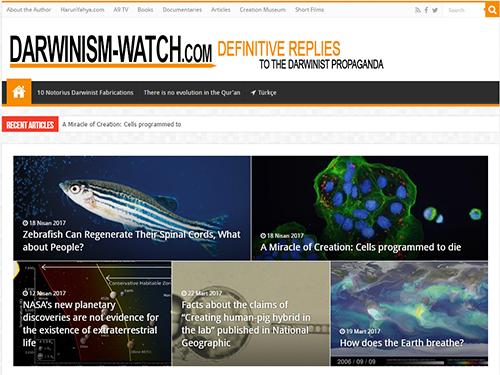 Every reaction against Darwinism has been misrepresented as "an attack on science." All forms of doubt regarding the theory of evolution are depicted as a kind of "backwardness or assault on science." Darwinists have misrepresented all kinds of false evidence as if it were a scientific finding. To put it another way, Darwinism has misused science for the last 150 years. 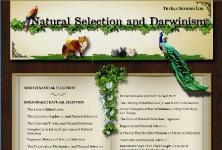 So is Darwinism really science? Darwinism is a deception. There is nothing scientific about it. Darwinism is simply as false endeavor aimed at getting people to believe a lie. Science is Darwinism's last refuge. Darwinism makes itself immune by the use of science. It defends frauds that it calls science. 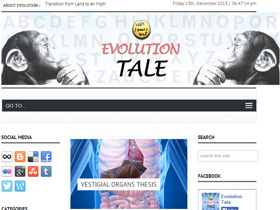 It describes Darwinists, who produce false evidence and tell fairy tales, as scientists. But it accuses the people who realize that Darwinism is a deception, and strive against it, of a betrayal of science. Science is Darwinism's greatest weapon. It has deceived countless people to date by wearing a scientific mask. And it is still using science to perpetuate that deception. That is why Darwinist scientific journals, Darwinist documentary channels and Darwinist scientists use it. The primeval atmosphere alleged by evolutionists never existed. This is so very true. 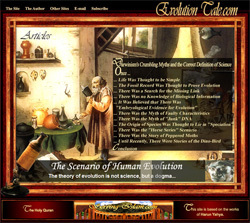 Evolutionist myths such as the supposed primordial Earth, the living species that emerged through mutations and natural selection, the mythical common ancestors and the strange-looking creatures that had not yet completed their development that appear in school text books and in newspapers, journals and on television are all the product of Darwinist scientists' own imaginations. They have never arrived at any assumed end over the years by way of natural selection. As Derek Ager says, genetic mutations also failed to produce that result. But they still imagine that to deny these scientific facts and continue to propagate the same false claims will increase the likelihood of the deception that is Darwinism spreading across the world. That is why Darwinists use scientific words, in order to make the Darwinist deception look more scientific. There are no scientific experiments or evidence that have been proven and corroborate evolution. All we have are frequently used scientific terms and formulae. One can often encounter such interesting terminology or chemical formulae in books by any Darwinist author. When someone ignorant of the subject looks at such books, he may really imagine that it contains a scientist's scientific knowledge. But appearances are deceptive. The only thing described in such a book is the myth that living things emerged and assumed their present forms as the result of blind chance. 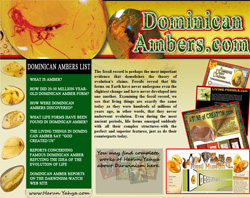 No Darwinist author has anything new to say, nor any scientific evidence to present. The chemical terminology and formulae are merely in order to complete the Darwinist deception and, in their eyes, give it a realistic air. These words are misleading. The extract refers to evolution taking place in local populations, but there is no evidence. It is even admitted that no evidence will be found, but even this is given a scientific gloss. The fact of the matter is this; no evolution can be seen in the fossil record, because no evolution ever happened. Under these conditions, someone whose experience is limited to what is shown and told to him may well form the impression that Darwinism is valid, if he has no power to think and reflect in an unprejudiced manner because with its conditioning technique, Darwinism somehow responds to the reader's expectations. It offers a simplistic account of life, in its own foolish eyes, and says this is "scientific." It says, "There is no need to question it, as it is true and proven." "Scientists confirm it," it says. "This is the only scientific explanation for life, and no other accounts are scientific," it says. "The whole world agrees," it says. And through these lies, one of the worst deceptions in history has been built up. And that is all it takes to convince someone who knows nothing about Darwinism, or what a gross deception it is, and whose entire experience is limited to these accounts. What about Stephen Jay Gould, a historian of science who has known for decades about Haeckel's faked embryo drawings? All that time, students passing through Gould's classes were learning biology from textbooks that probably used Haeckel's embryos as evidence for evolution. Yet Gould did nothing to correct the situation until another biologist complained about it in 1999. Even then, Gould blamed textbook-writers for the mistake, and dismissed the whistle-blower (a Lehigh University biochemist) [Michael J. Behe] as a creationist. Who bears the greatest responsibility here- textbook-writers who mindlessly recycle faked drawings, people who complain about them, or the world-famous expert who watches smugly from the sidelines while his colleagues unwittingly become accessories to what he himself calls the 'academic equivalent of murder'? The way that Darwinists misappropriate science and, furthermore, give the impression they are maintaining and preserving it, is in and of itself a huge deception. 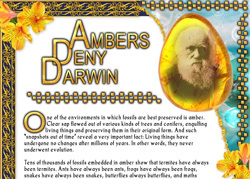 In fact, contrary to what it claims, Darwinism acts in complete violation of science. It tries to cover up the scientific evidence. It makes claims that contradict the results of laboratory experiments. 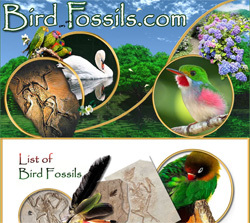 Even though the fossil record proves that transitional forms never existed, they still propagate the lie that living things evolved in such a way as to leave countless intermediate forms behind them. Scientific fraud is a concept born with Darwinism. 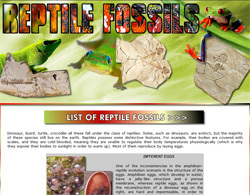 Darwinists misuse science museums and scientific publications and deliberately present frauds to people. They use scientific books and journals to spread the myth of evolutionary history, something that never happened. They draw a picture of a life form that never existed and try to give the impression that "this is our past." This religion, diametrically opposed to science, tells one of the worst lies ever under a scientific mask. The reason why Darwinists support such a terrible lie is without doubt their blind devotion to the way of the dajjal. The system of the dajjal is a perverse one that leads people to untruth. This is Allah's creation. Show me then what those besides Him have created! The wrongdoers are clearly misguided.